The GearWrench QuadBox™ Ratcheting Box Wrenches go well beyond handy and close to must-have once you get them in hand. Great ideas that have been well done. Ratcheting box wrenches have been around for some time but the folks at GearWrench® keep stepping that technology up, now with their innovative GearWrench QuadBox™ Ratcheting Box Wrenches. If you want to carry fewer tools to the job or to just have a better chance of grabbing the correct wrench size the first time the GearWrench QuadBox™ Ratcheting Box Wrenches are tools for you. The GearWrench QuadBox™ Ratcheting Box Wrenches are built around tough steel handles with plenty of mass to withstand the loads of tightening and loosening even stuck fasteners. Where these wrenches really veer away from the crowd is in the unique opening design that gives you four fastener sizes in each wrench! Each fastener-grabbing insert is actually two inserts in one. With one side up you can work with one fastener size, flip the wrench over and you get another fastener size! And they do all this with an overall thickness at the inserts that is not much larger than the single size versions. High quality steels and tight manufacturing allow these wrenches to grip tight and resist rounding off corners and do it in two sizes at each end! 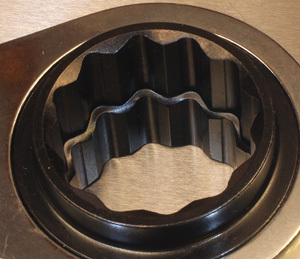 Another important feature of the GearWrench QuadBox™ Ratcheting Box Wrenches is the 5-degree movement that is needed to engage the next ratchet tooth. 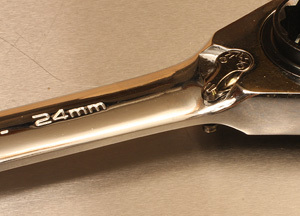 Most regular box wrenches need something on the order of 30-degrees to get the next bite which can really reduce their effectiveness when space is lacking. The GearWrench QuadBox™ Ratcheting Box Wrenches let you work quickly in confined areas without having to lift the wrench off to get another bite. A simple (and familiar) lever selector changes the GearWrench QuadBox™ Ratcheting Box Wrenches from tightening to loosening to further reduce the need to remove the wrench from the fastener until you are done. The two-sided insert (left) gives you two size capability on one end of the wrench, four sizes per wrench! The double-sided selector switch (right) and slim handle make using these tools easy. The GearWrench QuadBox™ Ratcheting Box Wrenches feel good in the hand and their fastener-grabbing inserts are cleanly made to get a good grip. The shape of the inserts engagement surfaces virtually eliminate slip and the rounding of fastener corners. In all of the work I did during evaluation with the GearWrench QuadBox™ Ratcheting Box Wrenches I never had one slip or even feel like it was beginning to come off of the fastener until I wanted it to come off. The handles are nice and thin but have plenty of length to generate the leverage needed to handle that size fastener easily. 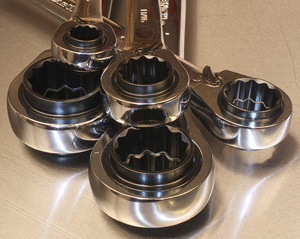 The ratcheting system is clean and positive with no slips or skips. The small 5-degree angle needed to move to the next ratchet tooth is very handy in small areas but when you have the room the ratchet zips along through the full range you have before locking to apply pressure. If the GearWrench QuadBox™ Ratcheting Box Wrenches have a deficiency I was not able to find it. If your expectations are at all reality based there is nothing about these tools to disappoint. They are well made and appear to be more than tough enough to continue working perfectly for a very long time. You can buy these wrenches individually or in the more popular sets as shown in this review. The #85204 3-piece SAE set covers 5/16" x 3/8" & 7/16" x 1/2" in one wrench, 9/16" x 5/8" & 11/16" x 3/4" in the second and 13/16” x 7/8” & 15/16” x 1” in the third wrench with the set selling on the street for $86.00. (7-8-2012) The #85215, 4 piece metric set has sizes 8mm x 10mm & 12mm x 13mm in one wrench, 16mm x 17mm & 18mm x 19 mm in another, 9mm x 11mm & 14mm x 15mm in a third and 20mm x 21mm & 22mm x 24mm in the fourth wrench and has a street price of $104.00. Not at all bad for this quality of tools. If you have been thinking about adding ratcheting box wrenches to your set take a look at the GearWrench QuadBox™ Ratcheting Box Wrenches. These appear to be a very good value in the tool market yet bring full capabilities for your tool dollar.